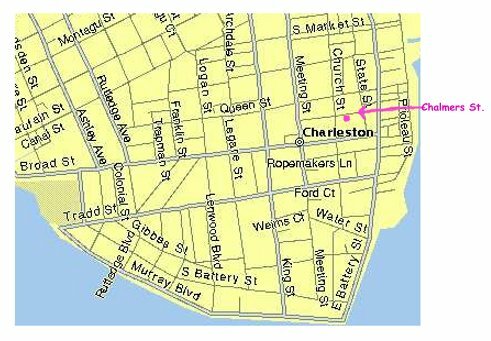 The Pink House Gallery is at 17 Chalmers Street, in downtown Charleston, South Carolina, USA. Just a block and a half from the heart of the Historic District, Charleston's Four Corners of Law, the gallery is on the well known cobblestone street, Chalmers, which is between and parallel to Broad and Queen. It is the quaint house in the middle of the block between Church and State Streets.